A Thermogram is non-invasive, without side effects making it an enjoyable experience. Your initial appointment will take 30 minutes. The test starts with your medical health history being taken. Please bring in your completed paperwork to your appointment; otherwise arrive 10 minutes early to complete the proper forms. In a private examination room with a room temperature of 68 degrees you will be asked to disrobe from the waist up in order to become acclimated to the temperature of the room. You will then partially disrobe the region being scanned. After the scanning is complete, all your information will be uploaded through a secure server and assigned to a doctor for final interpretation. 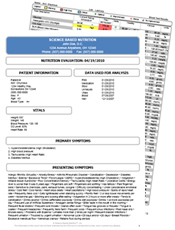 Once the report is received, we then forward a copy directly to you and any other physicians requested. Do not shower, bathe or exercise at least 2-3 hours before your exam. Any shaving of area to be imaged should be done the day before. Take no pain medications or aspirin at least 6 hours prior to your test. Be sure to advice the staff if you have taken medications, including blood pressure, alpha-blocker, circulation, anti-coagulant medicines, and aspirin or pain medication. Be sure to check with your doctor if changes to your schedule must be made. Do not sunbathe at least 3 days prior to your exam. Sunburn on the chest could interfere with results. Do not undergo any kind of physical therapy for 6 hours prior to your exam. No acupuncture, chiropractic, massage treatment or hot/cold pack for 24 hours prior to exam. Wear loose fitting garments prior to the exam. You will need to remove any jewelry in the area to be imaged. Do not consume any food or hot/cold beverages at least 2 hours prior to your exam. No gum chewing either! Please, drink water as usual. Do not smoke at least two hours prior to your test. Do not use lotions, ointments, antiperspirants, perfume or deodorants on or near the area to be imaged after you bathe. If you must bring a small child that needs supervision, please bring someone responsible to tend the child while your exam is being completed.